“M” Star or Merkabah Mandalas (or Merlin stars if you like) in the shape of what you may know as the Star of David, are very easy to build using Quartz crystals. To make the star draw two equilateral triangles to whatever size you wish to make the Mandala. Sit one triangle on top of the other to form the Star of David. You now have six points at which to place your crystals. The choice of location is important. You may have an intention to build them on ley lines or power points of the Earth’s energy grids. You can build them anywhere, in your back garden, or on a favourite place on one of your walks. It is always wise to ask for higher guidance for validation and for the most beneficial spot. 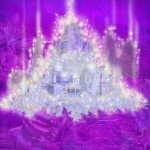 You will then need to consider in which direction you place the points of the crystals. Let us say for example, that we had chosen to reactivate an energy gridwork or Christ Consciousness gridwork; this will include sub-energy gridlines. the decision is now to know wether we spread the energies outwards from the points of the star, or to bring the energies to the central point of the mandala. When we place the crystal points inwards we are bringing energies into the crossing point. (also known as the chakra or acupuncture point of the planet. Putting the crystals in the ground with there points facing outwards, the cosmic energies will be transmitted into the environment in which the star is built. You will find that it will start to affect very large areas over a period of just weeks or months. The influence of the energy fields of mandalas can extend outwards up to fifty or sixty miles in diameter. The better you programme the crystals and the better you join up the M star, the bigger the field actually becomes. From the previous paper on crystal technology, we learnt that a crystal takes in the energy through its base, processes it through its shank and transmits through its point or termination. So you can see that the way in which the crystal is placed in the ground is very important. Another important aspect of mandala building is the programming of the crystals, which was covered in the last paper. The crystal must be cleansed before they are buried and as we explained, this is best done by using the third eye and focusing on the intent- the intent being that the crystal is now totally clean. Then program the crystal with the Father’s seed Blueprint for Creation and this is to be in accordance with the divine will. It is also important that you add a sub-program to your crystals. That program can be changed only by the person who programmed them for the mandala. By assuring that the crystals are programmed to channel the Father’s Seed Blueprint that is their own wholeness and in accordance with divine will, we never have to go back and re-programme the mandala when the plan changes. I think you must know by now that the plan is constantly changing. At one time we thought there would be a divine cosmic plan which would follow all the way through and we would be able to pick up the threads of the plan, and be able to have all the information on it right through to the time we had all made it back to godhead, as a complete course to Mother Earth. We now know that the divine plan is always changing, in that every time one person moves into the Light or one person changes the way they think – changes their thought patterns then the Divine Plan has to change. The result of the old way of thinking that there was a fixed plan would br that every time something happens on the planet you would have to go back and re – program your mandala. I have been building mandalas of all sizes for many years but we did make the mistake of putting fixed programs into our crystals on many occasions. I have been prompted by Merlin, Sananda and other masters to go back and re – programme some of these mandala some years later. This was because we did not use the Father’s Seed Blueprint program! By building your mandala in the shape of the star of David you are setting up a very powerful doorway to bring the loving Christ energies down into the material world. The Star of David is composed of tetrahedrons. Now tetrahedrons are the building blocks of manifestation, one of the building blocks of matter in the material world. By joining up these tetrahedrons in the Star of David form in your mandalas, you will get a hologram reflection of it through all dimensions, not just third, fourth, fifth but all three hundred and fifty two dimensions to Godhead and thus to the source itself. 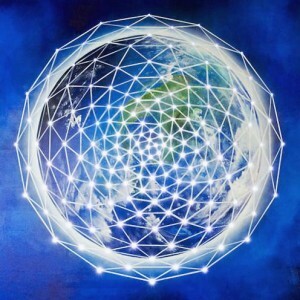 Obviously a correctly connected mandala gives us access to very powerful energies. This technology is actually very simple. People often think ” Oh I am not any good at this crystal technology, mandalas and all that, so therefore I cannot take on this work.” were you all to take on this work in one way or another, even if that is to build one in your garden. The crystals will obviously be buried and not lying around where they will get disturbed so you will have to dig a small hole in your lawn to bury the crystals. Once they have been programmed and linked correctly they will work for eternity. A local area could benefit from an M star and there are many people involved in such work. It does not cost a lot of money. Only ensure that the crystals have the best terminations. Do not use chipped terminations as they affect the energy characteristics; the way the energy comes out of the points. Just choose the best crystals you can according to your means. You do not have to spend a lot of money on this. Building a mandala is a very great service helping the planet and her inhabitants. In turn this reflects throughout the universe and helps the ascended masters in their purpose. Just build one in your garden and let it percolate away. You will find that once it is up and running you will really feel the benefit of these energies within you. You can also build mandalas in the attic of your house and anywhere there is geopathic stress. Many people spend a lot of money on trying to right geopathic stress or having their houses assessed with Feng Shui techniques. this can be very beneficial and helpful but by building an M star in your attic will get rid of the problems. You will be attracting light by the bucket loads. You will be bringing Christ consciousness into your environment and filling every space. within days you will feel the walls vibrating with light and they will be. You may sub – programme your crystals to bring down Christ Consciousness, light, unconditional love and the silver violet fire. By bringing this into your environment you will aid any unwanted energy to be dispersed and transmuted. you could also chant a silver violet fire mantra such as: ” I am the Silver Violet Fire I am the purity of God’s desire.” If you programme your crystals with that mantra as well as the Father’s Seed Blueprint you will find that your whole surroundings take up this vibration; you may see a silver violet light in things around you If you use the mantra, try chanting it three times in a row, three times a day. Three times is the number it takes for your consciousness to absorb it. This silver violet may also begin to reflect out of your jewellery with the use of the mantra. Metals are of a crystalline structure and take up this vibration naturally. You can programme your jewellery with this and it will give you a protection. In addition, you can use this in conjunction with Archangel Michael’s Pillar of Light protection. If you are using the Pillar of Light and you feel you are attracting negative energies, then consign them to the Silver violet Fire which transmutes them into pure energy. When you have these thoughts which are not of the Highest truth or the highest unconditional love grab these thoughts and throw them into the violet flames. Otherwise request the that the violet flames consume the negativity and purify your thoughts. By using the Silver Violet Mantra you can’t go wrong!